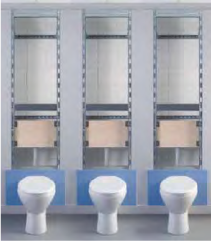 When compared to traditional IPS methods, Cubicle Systems can offer up to a 20% saving, greatly reduced risks, and minimised installation times. 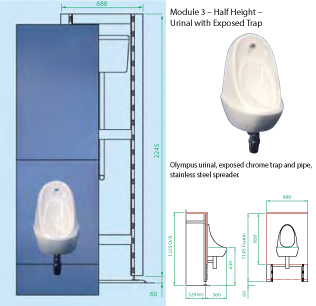 IPS, the perfect washroom solution. Cubicle Systems’ IPS (Integrated Plumbing System) conceals pipework, creating a new wall with access for servicing and maintenance. This creates a seamless and more attractive washroom solution. IPS panels can be produced and supplied to meet virtually any size requirement. Available as full or half height, the steel frame is adjustable, within its design limitations, to achieve a plumb level and inline installation. 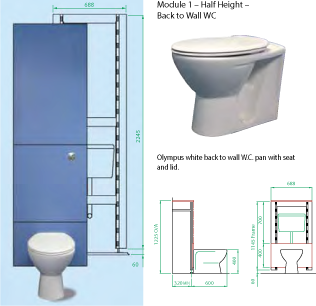 IPS wall duct panel system is offered with our standard range of sanitaryware and plumbing, but can also be supplied fitted with other specified sanitaryware. 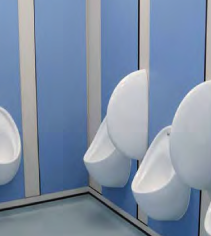 Cubicle Systems is an independent washroom manufacturer able to install and supply all makes or brands of sanitaryware. Save up to 20% cost saving. Choice of decorative panels finishes. 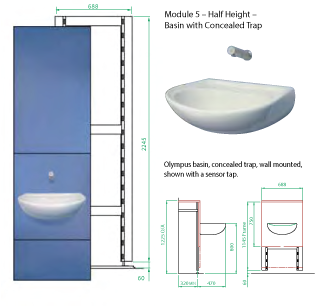 Supplied with standard sanitaryware or as specified by the customer. IPS is a complete system at a “fixed price” which eliminates extra cost or add-on charges. 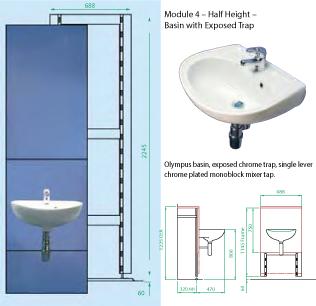 IPS modules are supplied with dual flush water management system as standard. 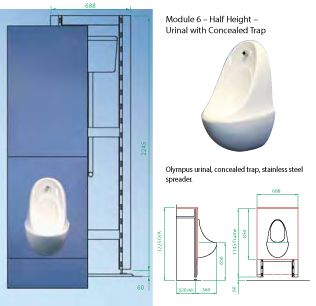 IPS panels are available in any sanitaryware and plumbing configurations including sensor automatic options. Lightweight modules, easy to handle, but robust. Cubicle Systems is innovating IPS panels and solutions, creating a; lighter, more attractive, sturdier, and more cost-effective service. This includes protecting against potential damage onsite. 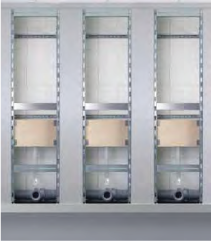 Factory manufactured modules are supplied with sanitaryware and decorative panels removed, which helps eliminate on site damage by other trades. IPS is installed by the site plumber, which means that modules arrive on site complete with sanitaryware and all fittings. This eliminates lost time sourcing individual parts required. 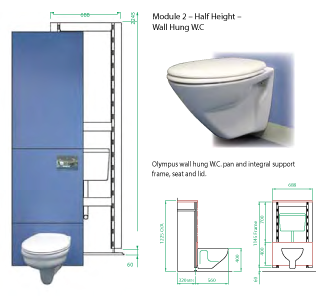 IPS (Integrated Plumbing System) is a fully adjustable steel frame fitted with decorative removable panels and available with a standard range of factory installed sanitaryware, pre-plumbed and tested, and is supplied as a complete module that requires only to be installed and connected to site water supply and services. IPS is installed by trained washroom installers but is commissioned by qualified plumbing contractors. 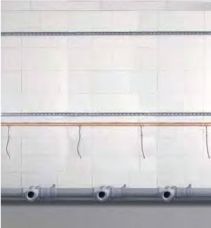 Water supplies and soil pipework are installed by the plumbing contractor, working in a clear unobstructed area, to predetermined positions as indicated within the site drawings provided. 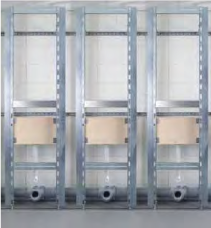 Water supply pipes are fitted with isolation valves, ready to connect with IPS modules. A seamless washroom design. 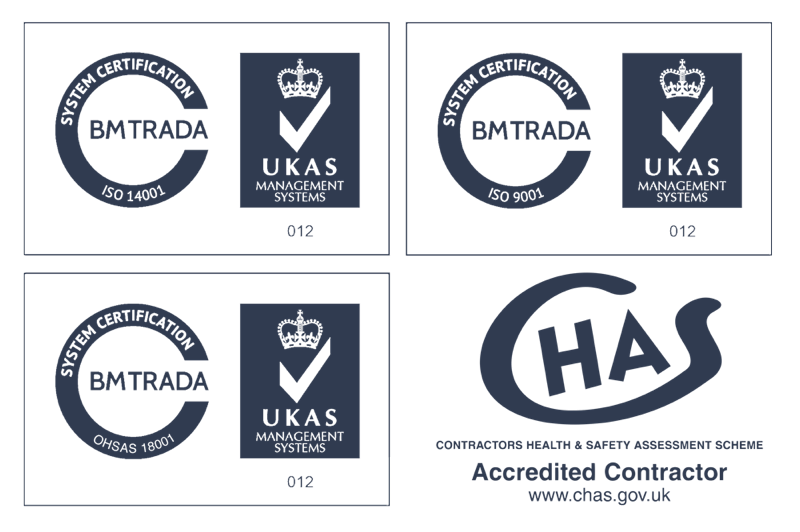 A better experience for its users, easier to install and maintain for tradesman, and a more affordable solution for you. Manufactured to standard sizes but available to suit all locations and specifications. Standard IPS steel frame and panel set. Olympus/Pressalit white seat and lid. Pneumatic, dual flush, push button set. Flexi cold water connector with shut-off valve. All necessary pipes, fittings and fixtures. Load tested to in excess of 200 Kg. Olympus Rema white wall hung pan. Flexi cold water connector with shut off valve. Chrome plated 40mm bottle trap. 4.5 litre auto cistern (shared). Chrome plated 32mm bottle trap. Duo deluxe single lever CP m/block mixer tap. Flexi hot and cold water connector with shut-off valve. Olympus white 520mm concealed trap basin. WP 40mm bottle shallow seal bath trap. 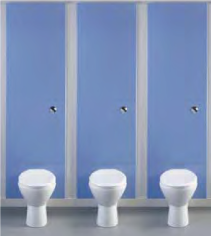 A cost-effective way forward for refurbished or new build washrooms. Site plumber receives site preparation drawing provided and installs water and soil pipework as indicated. All other concealed services installed at this time. Installer fits in position floor and wall track ready to receive IPS frames. The IPS frames arrive on site with sanitaryware and decorative panels already removed to avoid damage. The cistern remains fixed to the frame. The installer locates the IPS frame in the floor channel centred on the soil pipe inlet. Adjust for height, plumb and level, securely fix to floor and wall channels. Install decorative frame spacer panels, skirting wall and ceiling scribes. Installer repositions the bottom decorative panel, refits sanitaryware and connects flexible water supply pipes. The onsite plumber tests the system for leaks or non-conformities. Prior to acceptance, decorative panels are replaced after all service work has been carried out. The installation complete and tested, the installer replaces the decorative panels and silicon seals joints where necessary and cleans ready for acceptance by the customer. Damage to sanitaryware and decorative panels virtually eliminated. Smooth operation with plumber and installer working together.